Join us on Good Friday for a time of music, worship, and communion together. Before we celebrate the power of the resurrection on Easter Sunday, we invite you to meditate with us and to contemplate the sacrifice of the cross! Child Care available. *This service will be held outside weather permitting and inside if it is raining. However, if there is extreme weather, please look for a special email or FB update as to whether or not the service is cancelled. New Life's Costa Rica Mission Team is hosting a yard sale to raise funds for their upcoming trip. We would appreciate any of your treasures to help make this sale successful! Donations can be dropped off beginning April 28th after the second service ends. We will have areas marked for you to leave your donations. If you can price them that would be great too! Don't forget to tell people to shop the sale on May 4th from 8am to Noon, rain or shine. Sorry, we do NOT take clothing or tube TV's. Experience a new way to build relationships and personally reflect on stewardship, finances, time, gifts and talents . We are excited to introduce a new three week class that will dive deeper into what it means to be at New Life. This class will look at why we worship, why we do life groups and why serve. Every month we invite those who are new or wanting some information about New Life to join us for an informal gathering. Meet Mike and the staff, briefly learn about New Life and enjoy some yummy treats while getting to know others. Calling all Men! 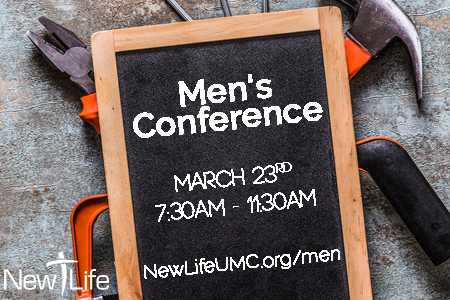 Saturday, March 23 will be an exciting day at New Life UMC as we host our first Men's Conference and Breakfast. We want all of the Men of New Life to be here (High School and Older) and invite you to bring a relative, a neighbor, or a friend. The fun starts at 7:30AM and will be done by Noon. Cost is $10 (Cash or Check) and you can give payment to Tim Covington, John Bennett, Jason Mabe or put in Rebecca Mabe's Mailbox at the church. Please join us as we come together to Worship, Fellowship, and learn more about being a Godly Man in an Ungodly World. As many of you know, the United Methodist Conference made some decisions a few weeks ago. We will have a meeting on March 18 from 7pm to 8pm in the sanctuary to discuss these decisions and the implication they might have. Everyone is invited to join this meeting. Everyone is invited to get involved with our wood ministry! It is held from 8am to noon. Help us cut and stack wood for those in need of fuel assistance during the winter. You will need to bring safety glasses and work gloves. 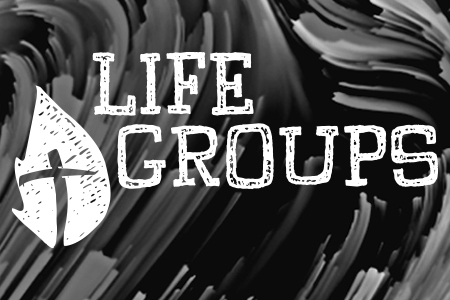 Every month we invite those that are new or wanting some information about New Life to join us for an informal gathering from 10am to 10:45am. Meet Mike and the staff, briefly learn about New Life and enjoy some yummy treat while getting to know others. First one is March 10 from 10:00 - 10:45. The M25 Youth Crew at New Life church is sponsoring a FREE Parent's Night Out for all parents of children between the ages of 3 through 5th grade. Whether you use this time for a romantic dinner or a quiet trip to the grocery store, let our M25 Youth take care of the kids! This month we are meeting on the 2nd of February! Everyone is invited to get involved with our wood ministry! It is held from 8am to noon. Help us cut and stack wood for those in need of fuel assistance during the winter. You will need to bring safety glasses and work gloves. All leaders and participants of ministry teams are invited and encouraged to attend Leadership Training on January 5 from 8:30 am to noon. 6pm Family Friendly - ASL Provided. Come join us for a Family Friendly experience as we celebrate together on Christmas Eve. 8pm Candlelight- Come join us for an intimate worship experience as we celebrate together on Christmas Eve. Youth Christmas Party! Sunday December 16th 6:00 - 8:00 pm. All youth 6th grade to 12th grade are invited. Bring one gift $20 and under to exchange in our white elephant. 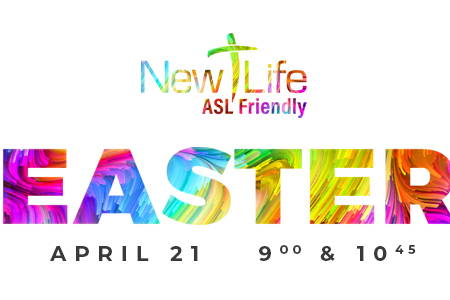 For more details please email Mandy Johnson at amanda.johnson@newlifeumc.org or text 804-819-9889. Start your holiday season off with Jingle Jam. This fun family event is filled with laughter, games, songs and more!!! Experience the meaning of Christmas through sight, touch, taste, sound and smells, A Sense-isble Christmas at New Life church. New Life 101 is an opportunity to get to know our Staff, as well as others who are interested in getting plugged into our church all while enjoying a fabulous lunch made just for you. 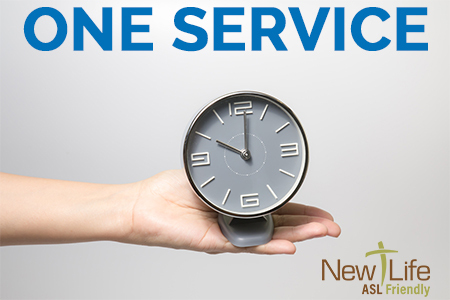 We welcome the opportunity to sit and talk with you about getting connected. Join us on September 23 immediately following the second service. Child care is provided. We are FOR RVA! Many people are more familiar with what a church is against rather than what the church is FOR. New Life church wants our community to know we are FOR them. We are For our schools. We are FOR adults, students and children. We are FOR our community because GOD is FOR our community. We want to make a meaningful impact in the lives of those around us. We are FOR RVA! Join us September 9-30 as we discover ways to be FOR RVA. Learn how you can be apart of #NLforRVA. We’ve got a lot of opportunities to get plugged in. We are excited to have one BIG bash as we end summer. The churchwide picnic and backpack blessing is on September 2nd at 10 am. This is our last 10 am service for the summer. Grab the kids and their backpacks and make sure you join us! Click on Learn More to let us know you're coming! Our MOPS ministry is sponsoring a fun morning with musician and storyteller Jeff Beatman on August 27 at 10 am! After the concert, stay for popsicles on the playground! The Road the church is on, Old Hundred Road, will be closed after reaching Watermill Parkway if you are going Westbound. The road will be closed to through traffic at Tomahawk Creek beginning July 9 for a pipe replacement project and work is expected to be completed by late July with weather permitting. The detours are: If you are traveling Eastbound on Old Hundred Rd, take Woolridge Rd south to Watermill Pkwy north back to Old Hundred Rd. If you are traveling Westbound, take Watermill Pkwy south to Woolridge Rd North back to Old Hundred Rd. We have a great opportunity to connect with our friends in Brandermill as we volunteer during their 7.4K Run on July 4th. We are looking for 10 to 12 volunteers to register runners, hand out water, take pictures, and cheer runners at the finish line. The event is over by 10am so you will be in time for all your July 4th celebrations. Support our community and volunteer. Contact us below for more details and to sign up.